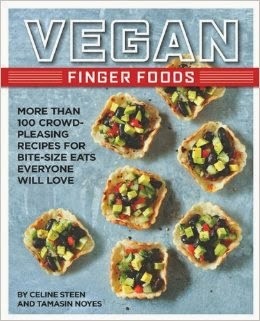 justthefood.com...the blog: Vegan Finger Foods, a Book Review, a Recipe, and a Giveaway! With everything from Zucchini Cups (page 30) to Goji Berry Cacao Bites (page 151) there is something to suit every taste. I really love just about everything this book has to offer. Creative recipes, beautiful photography, a clean layout that makes it easy to use, a comprehensive index, a handy list of menu suggestions in the back, and a quick intro that let's you get right to the recipes. Simply put, this book has made me the vegan version of Cher's character, Mrs. Flax, from the movie Mermaids, who only makes finger foods. Only, I am now armed with some of the best finger food recipes ever. Mrs. Flax couldn't lay a finger on these finger foods! Celine and Tami were kind enough to allow me to share a recipe with you to get your fingers warmed up and ready for action. So enjoy these gorgeous little swirls,and then head out and buy a copy of Vegan Finger Foods for yourself. You won't be disappointed. 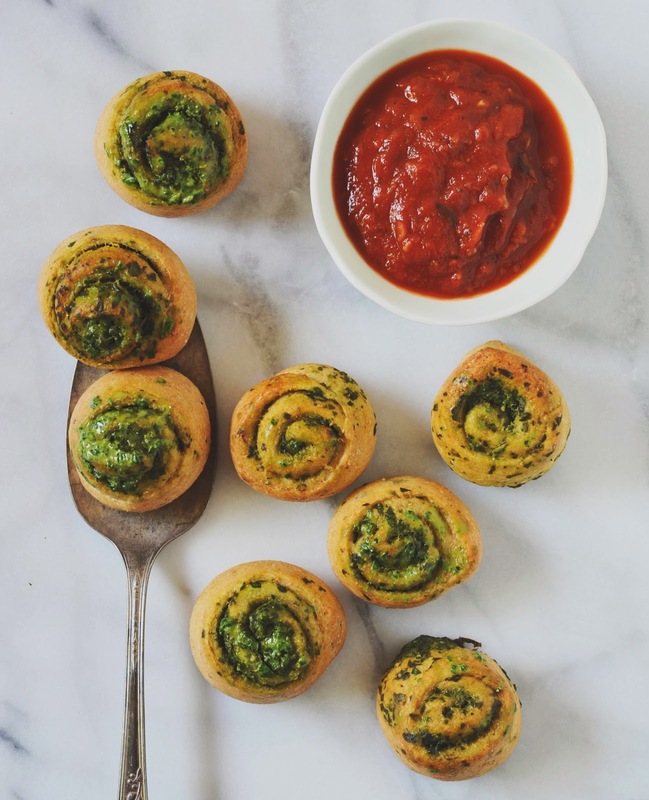 Spinach Swirls from Vegan Finger Foods by Tamasin Noyes and Celine Steen. Photo by Celine Steen. These easy little spinach bites are an impressive part of an appetizer spread. Try to resist eating the filling with a spoon, but we won’t blame you if you do. Serve these with our Quickie Marinara (page 16). To make the dough: Stir together the water, Sucanat, and yeast in the mixing bowl of a stand mixer fitted with a dough hook. Stir and let sit for 5 minutes, until the yeast bubbles. Add the flours, oil, Italian herb blend, and salt. Mix on low until the dough forms a smooth ball, about 6 minutes. (Alternatively, knead by hand on a lightly floured surface for 10 minutes.) Add an extra 1 tablespoon (8 g) flour or (15 ml) water if needed to make a cohesive dough. Coat a large bowl with cooking spray. Round the dough into a ball and place it in the bowl, turning so the oiled side is up. Cover with plastic wrap and let rise until doubled, about 1 1⁄2 hours. Lightly dust a work surface with flour. Divide the dough in half and roll each half into an 8 ≈ 10-inch (20 ≈ 25 cm) rectangle. Preheat the oven to 375°F (190°C, or gas mark 5). To make the filling: Stir together the spinach, nutritional yeast, oil, and pepper in a medium-size bowl. Spread half the filling evenly on each rectangle. Roll from the 10-inch (25 cm) side, pinching the dough together as you go, including the ends and the last edge of the dough, so the swirls don’t unwind in the oven. Cut each roll into 1-inch (2.5 cm) slices, and place on a baking sheet with the filling side on top, and against the baking sheet. Bake the rolls for 18 to 22 minutes, until lightly browned and the centers are cooked. Serve hot, warm, or at room temperature. The fine folks at Fairwinds Press were kind enough to offer up a copy to giveaway to one of you, lucky readers! Simply follow the prompts below to enter. US and Canada only. I love appetizers and those Swirls look great. Thanks for the chance! My favorite appetizer are little tacos. Peanut butter on whole wheat crackers. Cheap and fast for when I am starving. I am crazy about finger foods too. Anytime that I'm at a restaurant with interesting vegan appetizers (sorry, pita and hummus), I'm pretty excited. Right now buffalo seitan sounds like the most fun. I go for crisp snap peas dipped in hummus or miso/tahini sauce. stuffed mushrooms is my fav right now, but I love appetizers in general! Vegetable dumplings, although I rarely eat those with my fingers :). I love roasted chickpeas. They are simple but yummy! Thanks for the chance to win! Ahhhh...I love finger foods !!! Difficult to identify just one. I would say hummus or a great vegan dip with vegetables. Nacho is also very good...Yummm !!! I want to say something healthy but.... I'm dying for a good vegan jalapeno popper. For now I'll say nachos. Raw veggies with a dip of some sort. I love chip and fresh salsa! Yum! Chips and guacamole are my favorite right now! Pita wedges with roasted red pepper hummus and kalamata olives. I like hummus with little carrots. I have a great stuffed mushroom recipe which is mushrooms (& a few other things) in mushrooms. I love falafel balls and I just learned from a friend about roasting/baking them instead of frying them. A bit crunchy and not so much oil. Great. Raw veggies dipped in salsa/avocado/lemon juice mixture. Thanks for doing the giveaway! I like red bell peppers dipped in hummus! I eat almost all my food with my fingers so all vegan food is my favourite vegan finger food! Chips and salsa. I need more ideas! Taco fiesta potato crisps from Oh she glows cookbook. It's not quite an appetizer but I love anything dipped in PB or any nut butter. I'll make a snack plate of crackers, apple, granola, etc and a big bowl of PB for spreading. For parties I like veggies and dips, hummus, salsa, and this pineapple pico de gallo I get from a local grocery! Eeek! I love adorable little finger foods too and I just got my review copy of the book. The spinach swirls are definitely on my list of things to try. Thanks for sharing and please keep us informed with new informtion when possible. I have some related information you may like below.